She has her own website, Facebook page, Twitter account, merchandising range and countless fans. Now, after a journey halfway round the world, the record-breaking Australian mare Black Caviar has won her 22nd consecutive race to thrill the crowds at Royal Ascot. But it was only just for the 1-6 favourite as jockey Luke Nolen admitted easing up too early before hanging on by a nose from 5-1 shot Moonlight Cloud in the Diamond Jubilee Stakes. The narrowest of victories was merely the latest twist in an adventure which began with a 10,000-mile trip. Black Caviar stood for more than 30 hours in a spandex compression suit inside a special cargo crate as she flew from Melbourne to London Heathrow via Singapore and Sharjah. Once in London, the horse was taken to stables in Newmarket where she was in quarantine for 48 hours. The thick-set dark-brown beauty brought an entourage of nine with her, including a vet, a farrier and a chiropractor. Co-owner David Taylor estimated the whole sojourn will have cost 150,000 Australian dollars (nearly £100,000), of which a third was spent on transport. All of this so she could put her modern-day record unbeaten run on the line and claim victory in her first race outside her homeland. Black Caviar's silks of salmon with black spots were sprinkled liberally among flag-waving followers around the Berkshire course. More than 6,000 Australians are estimated to have been at the track to see the "Wonder from Down Under" squeak home in a contest which lasted all of one minute and 14 seconds. Company director Dean Portelli, 49, from Melbourne, was among a group of 26 visiting Royal Ascot for the first time to see the odds-on favourite in action. "Black Caviar just captures the imagination. For me, she is a heroine - I would put her on a pedestal," he said. "There are Aussies everywhere here - I've bumped into lots of people I know. "We didn't fly halfway round the world to see her get beaten. Only an accident would have seen her lose." The visit has not come cheaply, but no-one was complaining as they witnessed the most famous horse to have raced in Australia since the legendary Phar Lap in the 1930s. "The trip has probably cost us about 10,000 Australian dollars (about £6,500) each but to be at this occasion and see Black Caviar and the best horses racing, it doesn't seem that expensive," said Greg Fagan, a 56-year-old Australian investment advisor. 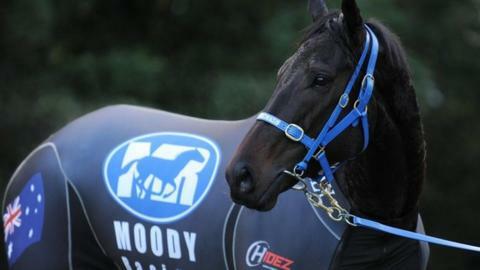 Black Caviar, affectionately nicknamed "Nelly", is trained near Melbourne by Peter Moody. Despite being a female sprinter running over six furlongs, at 565 kilograms (about 88 stone) she weighs more than bulky former steeplechasing star Denman. Her stride has been independently measured at 8.33m, meaning she takes 24 strides over 200m (a furlong). Her rivals can take 30 to cover the same distance. The horse, who has earned £3.6m in career prize money, is owned by five couples who bought her for 210,000 Australian dollars (about £140,000). Saturday's feature race boasted a winner's purse of £283,000, but bigger rewards are on offer in Australia. "The prize money doesn't compare with what our races are worth in Melbourne. It's more about the experience and prestige," co-owner Jill Taylor told BBC Sport. Her husband David said the six-year-old mare was calm amid the fuss. "She's quite the opposite to my wife, she's at peace at all times," he joked. "In all seriousness, you'd have to describe her as an amazingly placid horse. "Then when she gets mounted up by the jockey, her head goes up, her ears go up, and she's here for business. Immediately after the race, the head goes down again. "There's never been a moment we've seen where she has shown any antagonism to anything, which is most rare for such a high-powered horse." He said the horse had coped well with the marathon journey. "On the flight, she was stood up for 32 hours, which was quite amazing," he said. "She only lost 10 kilos in weight, whereas most of the horses travelling that distance will lose anything from 40 to 50kg, through sweating and the travel, which emphasises what a relaxed beast she is. "The theory with the [spandex] suit was that it would help with the warmth and the circulation of the blood." Jill said the mare, who was patted in the parade ring by another leading lady - the Queen - took the attention of a 70,000 crowd at Ascot in her stride. "She's very good at posing, loves the attention and works it to a tee - it's almost human. She will come out, and give the photos as required," she said. In her last race before Ascot, at a meeting at Morphettville, Adelaide, which normally attracts 3,500 racegoers, Black Caviar pulled in 10 times that number. "Queensland, Melbourne, Sydney, Adelaide - they have all been sell-outs," added David of the horse who has been called Australia's biggest export since Kylie Minogue. So, just what is it that marks Black Caviar out as a phenomenon? "The horse is a magnificent specimen, the trainer is a brilliant placer of horses, there's a wonderful and funny rider, and a bunch of owners getting such a thrill and privilege out of what we call Australia's horse," said David. Well past midnight in Melbourne, the city's Federation Square was packed with revellers watching the race on big screens and they roared their approval as their mare racked up win number 22 in the most dramatic of circumstances.